I was asked to name MY BEST CUSTOMER by BNI (during our Weekly Presentation) recently and I could think of none other than MAHAVEER SRISRIMAL. The Heart issue in March sealed the fact that I had to take it easy in life from now on. So I not only decided to move to a new bigger office but close down the existing 2 small offices. So after 3 months of thorough search…I zeroed on a location and decided to move there. The office was a OPEN HALL and I had to set it up in a scratch. The search for the good electrician, carpenter, painter, was the biggest pain. I just couldn’t zero in on the right persons. FINDING A RIGHT PERSON TO SET UP A NEW OFFICE IS AS TOUGH AS FINDING A GOOD FINANCIAL ADVISOR!!! I had almost decided that I would have to compromise either on price or quality, when one of my oldest investor MAHAVEER SRISRIMAL came as a messiah. He came to know about me setting up of new office and dropped in to have a look. As soon as he came to know about the issue troubling me….he volunteered to STAND FOR ME AND LOOK AFTER THE SETTING UP OF THE OFFICE. Another thing which was bothered me was the NEW office was the distance from my residence. It would take half an hour one way amid chaotic traffic and I had to compromise on my business too. 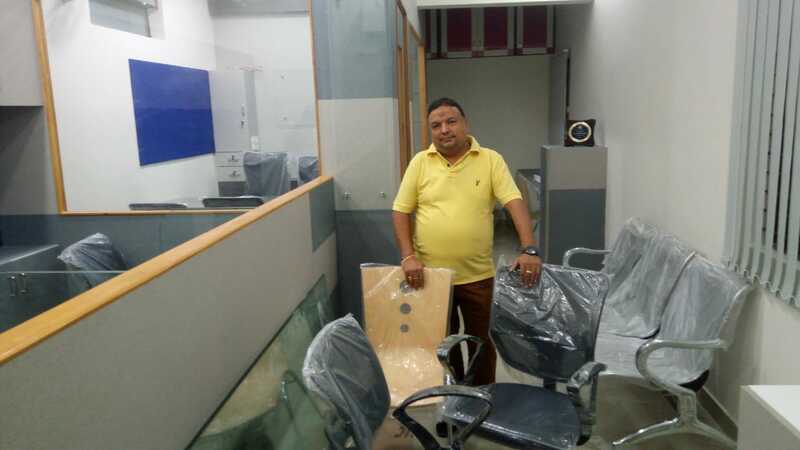 But, yet again, I was saved from this work as Mahaveer ensured that I could concentrate 100% on my business and MAHAVEER SRISRIMAL would come to the NEW office to keep an eye on the Work being done at least 3 times a day. He would call me every time he came....sent me Whatsapp image and even videos to keep me updated. In fact, I was so FREE that I even went ahead going to MFRT conference in New Delhi as I knew that MAHAVEER SRISRIMAL is there to ensure that my office is coming up exactly as I want. Its rare to find a TRUE FRIEND. Its rarer to find an INVESTOR / CLIENT who becomes a TRUE FRIEND and even more than that. It was as if another SRIKANTH MATRUBAI was looking after the NEW OFFICE. When I moved in, I felt like moving into a PLUG AND PLAY Office!! This question is pretty natural. Let me put things straight. About 10-11 years back, when I first met MAHAVEER (he was not my friend...but my brother's friend) & I discovered that he had virtually ZERO investment and no future goals. Cut to present, 2 of his children's marriage is over and he did have to take out SINGLE PAISA from his business. EVERYTHING WAS FUNDED BY HIS INVESTMENT IN MUTUAL FUNDS. And, guess what? For this 3rd child's marriage also, the amount is READY!!! To show the gratitude, MAHAVEER felt this is the best way and I would vouch this is INDEED the BEST WAY. He helped me in PEACE OF MIND for my office. For me, his help was bigger!! And finally, I would say I AM MORE IN GRATITUDE towards him ….simply because of the Mental, Physical trauma I was going through. Will be ever indebted to you and proud to have you as my Investor and most importantly as my FRIEND now. You, MAHAVEER SRISRIMAL are not amongst my Top 10 Investors in terms of Either Lumpsum or SIP. But, you are amongst the TOPMOST Investor in terms of GRATITUDE that I have. NOT THE ONE WHO GIVESYOU SALE or REVENUE?? THE BEST CUSTOMER IS THE ONE WHO HAS GIVEN YOU PEACE OF MIND. I WOULD PROUDLY SAY YOU, MAHAVEER SRISRIMAL, IS MY BEST INVESTOR AND I AM PROUD TO BE YOUR FINANCIAL ADVISOR. WHAT BETTER DOES A FINANCIAL ADVISOR THAN A INVESTOR LIKE MAHAVEER SRISRIMAL. Very true, proud of you and Mr Mahaveer. It's most satisfying when clients appreciate our efforts this way.